The Superman Fan Podcast: Episode #378 Part I: Superman Comic Book Cover Dated January 1965: Superman #174! 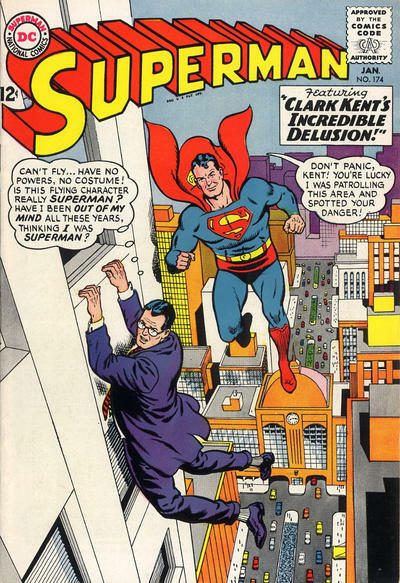 I really enjoyed "Clark Kent's Incredible Delusion". It really presented a mystery for Clark, and for the reader. You noted, on the cover, the building with traffic going through it in both directions. There has long been such a building in New York City, so I assume Curt Swan was familiar with it. The New York Central Building (later the New York General Building, now the Helmsley Building) on Park Avenue was built in 1929, and designed with two portals, one for uptown traffic, and one for downtown traffic. The building on this issue's cover doesn't look a lot like the actual one, but maybe it was artistic license. Thanks for the link! I had to share it on facebook so others could check it out. Oh, I forgot to thank you for your review of Action Comics #1000. I really enjoyed that 80 Page Giant, celebrating the 80th anniversary of Action Comics #1, although, like you, I found myself scratching my head a bit at the end of "The Fifth Season".